They're just over 8 1/2 inches in diameter and while you'll likely find smaller ones as well, I think the larger rounds are the way to go since it makes handling/rolling easier. I've always been a bit nervous about working with these delicate wrappers, or spring roll skins, but it turned out to be a lot easier than I thought. And I particularly like the uniquely soft, thin skins of spring rolls. In addition to the leftover ground chicken in hoisin sauce, I wanted to add some traditional vermicelli noodles into the spring rolls to bulk them up. I used the ones shown above. I made 3 large rolls with my leftovers and used just half of one package. These thin noodles only need to be soaked in some just-boiled water for about 3 minutes. Then, I removed the noodles and used the now warm water to soak the spring roll wrappers. For other spring-roll making novices like myself, it may be helpful to know that they are pretty easy to make. You need a gentle touch but if you're not too concerned with perfectly formed rolls, it's a simple enough process. To assemble, have everything in place so you can work quickly. Soak a spring roll wrapper for just a few seconds in warm water until it starts to bend and become pliable but is still slightly firm (it will continue to absorb the water and become softer) and lay it out on a flat surface like a cutting board. I laid my filling - shredded carrots, some vermicelli noodles, then a few spoonfuls of my leftovers - down near the middle of the round. Gently pick up the edge of the wrapper nearest you and fold it over the filling. Then, I folded in the sides and continued to roll it to a close. You need a little dipping sauce and this couldn't be easier. Just two ingredients! Take some hoisin sauce and thin it out a bit with some warm water. That's it! This is something we've done to go with things like pork ever since I was a kid. These spring rolls are best served on the spot after rolling. If necessary, you could keep them for a few hours by wrapping them individually in plastic wrap, not touching each other (to prevent sticking), so they stay moist. I also put a damp paper towel on top for a little added insurance. If you need to refrigerate them for longer, I suspect steaming cold spring rolls is the best way to revive them. Otherwise, you might end up with those cold, hard, disappointing, spring rolls you sometimes get at a restaurant. That's my little fun for today. Hope this inspires you to put a little twist on your leftovers! In a measuring cup, combine hoisin sauce, soy sauce, sesame oil, and water. Heat a skillet over medium heat. Add oil and a pinch of red pepper flakes, if using. Add ground chicken and cook, breaking up the chicken with a wooden spoon or spatula. Cook until browned, about 4-5 minutes. If there is a lot of liquid at the bottom of the pan, drain/spoon out the majority of it. Add garlic, ginger, and scallions (except for reserved greens). Cook for 1-2 minutes until fragrant. Stir in hoisin sauce mixture and cook for another 1-2 minutes until sauce thickens and is throughly combined with the chicken. Taste, and season with salt and pepper, if necessary. Sprinkle the top with the reserved scallion greens and chopped peanuts. Ladle on top of rice and serve immediately. (If desired, reserve some of the chicken mixture to make spring rolls below). To make spring rolls, place spring roll wrapper in warm water for a few seconds until it just begins to soften but it still slightly firm (it will continue to soften as it absorbs the water). Lay wrapper on a clean cutting board or towel. Place filling ingredients in the middle of the wrapper horizontally. Gently pick up the wrapper edge nearest you and fold it over the filling. Fold in the two sides and continue to roll to a close. Continue making spring rolls with remaining ingredients. Stir water into hoisin sauce to make a dipping sauce. Rolls are best served immediately, with dipping sauce alongside. To keep for a few hours, wrap spring rolls individually in plastic wrap (to prevent sticking) and cover with a moist paper towel. I like to make similar homey stirfries like this, but often with oyster sauce. These spring rolls look particularly fresh and appetizing. Oh yes, I would be lost without my oyster sauce. That is my go-to as well when it comes to flavoring my stir-fry but I had this in mind because I really wanted to finally use my spring roll wrappers and give that a try! Love stir-fries too and really love that you used leftovers to make healthier spring rolls. That's such a great and tasty idea! Definitely making me hungry looking at them - is it wrong that I want some for breakfast? haha :) Have a great weekend Monica! haha - I could eat all kinds of things at any time of the day and year, too, Kelly. The spring rolls were fun...one of those things I've wanted to make at home and finally did. Nice and forgotten flavors in my house! Thanks for a tasty remainder! You're right - sometimes it's easy to forget those go-to basics. Your spring rolls look terrific. And I'm a big fan of stir fries as a way to use up the random ingredients in my fridge! I am always a huge fan of spring rolls. The texture of the wrappers is chewy which I love! 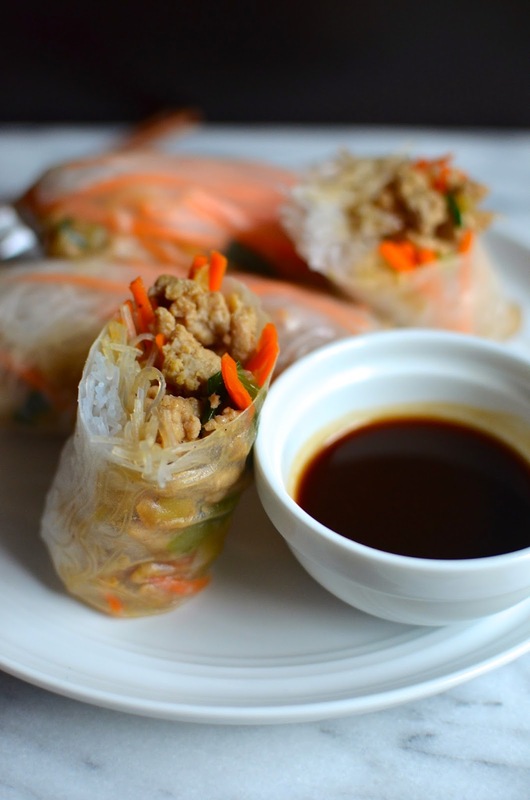 It is such a great way to use up some leftover ingredients in spring rolls. Sounds DELICIOUS! I love that thin, chewy texture, too! I won't be so shy about those spring roll wrappers going forward. haha - thank you so much! He he Monica... we seem to be liking and cooking similar things. I made a prawn hoisin stir-fry a couple of days back and was contemplating whether to post it. Like you, stir-frys make my life easier all the time and an Asian pantry is the best way to achieve it. Both your dishes look and sound incredibly good. Why have I never thought of adding Hoisin to chicken mince! Lovely recipes...I'd love to make both of them soon. That's the beauty of having a recreational food blog - we can post whatever we want/when we want. : ) And what I want is your prawn stir-fry! It sounds wonderful! I should not read food blogs before dinner! haha you are making me so so hungry right now! I love making stir-fries during the week. This looks delicious - as do those spring rolls! Great recipes Monica - I love getting two meals from one batch - leftovers are our friends. I've always wanted to make spring rolls too - love them! Have a wonderful week. Thanks, Tricia. It's nice when one thing leads to something else...it worked out pretty well! The stir fry looks like a wonderful weeknight dinner and I bet the ground chicken really soaks up the flavor well. I never think to use ground meat for a stir fry. The spring rolls look gorgeous. I've wanted to make them for a long time, but haven't gotten around to it yet. I am all about quick and easy and during the busy week. We eat alot of Asian stirfries as well. I don't use hoisin sauce so very much but that sure does make things easy with few ingredients needed. Love your idea for leftover ideas. Tonight I made Korean, not so very quick and easy as it always requires so many little dishes and lots of prep/marinating and all that work and they boys had it demolished in less than 5 minutes. Really... Wishing you a super weekend. No kidding! 3 bottles is very impressive! I'm glad I'm not alone on the spring rolls...turns out, it is pretty easy and if you have leftovers you can "stuff" them with, it's not nearly as big a project as it seems. And believe me, I think food is much better at your place!! oh.... i love both! Now I have a problem in choosing between two of them! They both look delicious! You redecorated, Monica! How pretty! I love the delicate colors and the Asian inspired floral prints on the banner flags! When you call this blog "recreational" you are only referring to your attitude of having fun with it. The new look, the photos, your recipes all say "professional"! :) Stir-fries of many kinds are our go-to quick meal (as well as occasionally more elaborate planned meals). Ground chicken is a staple at our house and though its not "authentic", its quick and easy and what I have on hand most of the time. My daughter's stir fries are more complicated because they involve lots of veggie chopping (she is vegetarian) and specially purchased gluten free sauces. Thankfully, there are more and more gf Asian sauces readily available. I am very intrigued by the Spring Rolls because the ingredients on the wrappers appear to be gluten free! This will be my next Monica Inspired Culinary Adventure! p.s. No one will believe this is the first time you made those rolls. They are beautiful! Thank you for all the kind words. You always make me blush in the sweetest possible way. I am always taking out my amateur-badge because I don't want anyone mistaking me for anything but! Honestly...I'm afraid I make myself sound more knowledgeable than I am! : ) Glad you like the stir fry and spring rolls. I'm glad your daughter is so well versed in the kitchen. There is a lot of work involved with being a vegetarian and eating well, I think.